Management education and training was a key influence on Canadian capital and labour in the post-World War II decades, however it has been the subject of comparatively little academic inquiry. In many ways, historians have frequently learned about management behavior in unionized workplaces by examining labor-management relations. The management experience has thus often been seen through the eyes of rank-and-file workers rather than from the perspective of managers themselves. This book discusses how managers were trained and educated in Canada in the years following the Second World War. 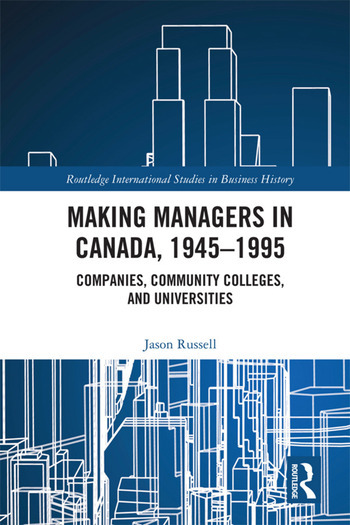 Making Managers in Canada, 1945 – 1995 seeks to shed light on the experience of workers who have not received much attention in business history: managers. This book approaches management training from both institutional and social history perspectives. Drawing from community colleges, universities, and companies in British Columbia, Ontario, and Québec, this book reveals the nature of management education and training in English and French Canada, It integrates institutional analysis, and examines how factors such as gender and social class shaped the development of Canadian management in the post-war years and illustrates the various international influences on Canadian management education. Jason Russell is an Associate Professor at Empire State College, USA.